On 2 July 1.916 the Racetrack of Lasarte in San Sebastian was inagurated, in presence of their Majesties the Kings of Spain. Thanks to Georges Marquet, visionary of the epoch, he perceived a great opportunity to inagurate a new racetrack in a place without practically tradition to horse racing turf, but that given the situation in Europe, with the I World War, saw the opportunity of attracting foreign important persons related with the turf, especially from the South of France to participate in Lasarte. The success of this initiative was such that about four hundred horses arrived to Lasarte, together with jockeys, trainers, owners, and grooms, who made of Lasarte the meeting point of races of the Fench owners. 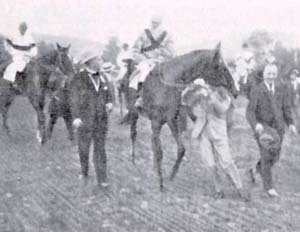 The season which was starting, was of 42 races, including the inaguration day, with the Grand Prix of San Sebastian, endowed with nothing more and nothing less than 100.000 French Francs, and with 26 participants, winning the race Teddy, property of JD Cohen, since at that epoch only the national prizes were paid in Pesetas. 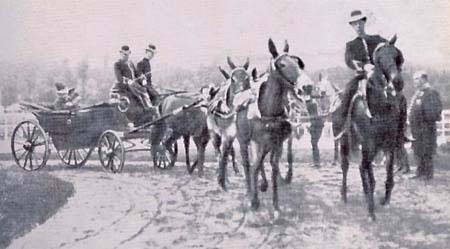 Races were celebrated in 1.917, with 38 racing meetings, in 1.918, with 52 meetings, and other 12 which were celebrated in Santander, but that year the War ended and practically all the foreign Stables went back to their origin countries, leavings in a precarious situation the racetrack, due to the so important reduction of effectives which took place. Once the War ended in 1.939, the races returned to Lasarte one year later, and Lasarte had a priority target: to recover the beginning of its road to 1.916. So, in 1.948 was celebrated, after the Civil War, the first International Grand Prix in San Sebastian, in which the doors were opened again to the foreign horses.In 1.957, the first competition between Spain and the French Southwest, reaching the highest point in 1.966, the year in which was the anniversary of the 50 years of the birth of the Lasarte Racetrack. Without any doubt, if there is a trial which marked, and still marks today the races in San Sebastian, it is the San Sebastian Gold Cup, top trial of the Summer season and together with the Grand Prix of Madrid, they brought the maximum interest of the races in Spain, whose first edition took place in the year 1.969, and was won by Phaious with 60 kilos and ridden by Bouland, and Maspalomas getting the second place. From that moment, the Spanish victories began in the Gold Cup, winning, in later years, Donagua in 1.970 with Claudio Carudel or Terboch the next year with Roman Martin. What is certain is that the Gold Cup, nowadays continues setting the example in the Spanich Horse Show Calender, which is an appointment for great national and French horses.